In an extensive interview with The Atlantic’s Jeffrey Goldberg, Prince Mohammed laid out his vision for the future of the Middle East, including the possibility of cooperation with Israel. 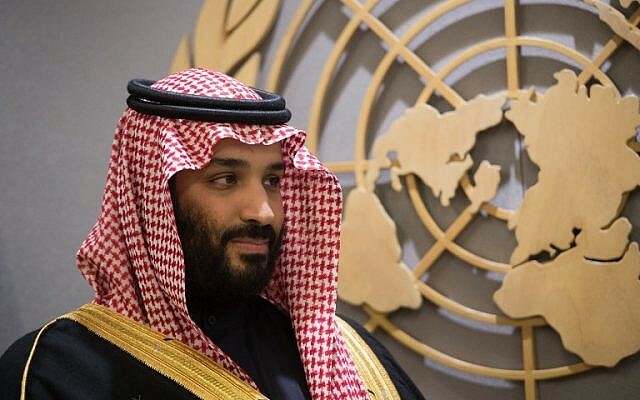 However, in keeping with the terms of his kingdom’s regional peace proposal, the Saudi crown prince added that an agreement with the Palestinians was a prerequisite to formal relations. “But we have to have a peace agreement to assure the stability for everyone and to have normal relations,” he said. Israel and Saudi Arabia have no official relations and the kingdom does not recognize the Jewish state. Israel has hinted at clandestine ties with Saudi Arabia in recent years, stressing the two countries share an interest in countering Iran. The rumors of covert relations have been denied by Saudi officials. Still, a Saudi general visited Jerusalem in 2016 and met with Israeli lawmakers, and Saudi officials have met with Israeli officials on several occasions in public; Saudi Arabia also last month allowed Air India to fly to and from Tel Aviv via its air space. Asked about the differences in how former US president Barack Obama and his successor, Donald Trump, chose to deal with the Iranian threat, Salman said that although the 2015 nuclear deal with Tehran aimed to curb the Islamic Republic’s fanaticism, it included risks his country could not afford to take. “President Obama believed that if he gave Iran opportunities to open up, it would change,” Salman explained. “But with a regime based on this ideology, it will not open up soon. Sixty percent of the Iranian economy is controlled by the Revolutionary Guard. The economic benefits of the Iran nuclear deal are not going to the people. In a major Saudi shakeup last year, Prince Mohammed pushed aside his older and more experienced cousin to become first in line to his father’s throne, setting himself up to control Saudi policy for decades to come. The Saudis are working aggressively to change perceptions. They’ve cast themselves as essential partners against Islamist extremist groups and, especially since Trump’s maiden overseas voyage last year, touted their lavish purchases of high-tech goods from job-creating American companies. In Yemen, the kingdom says it is improving military targeting, opening up ports and pledging $1.5 billion in new aid.